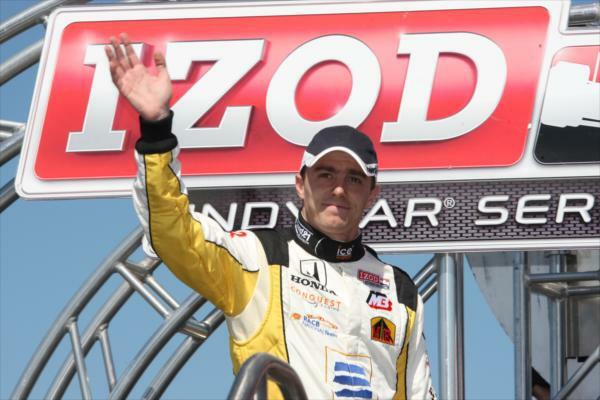 Big shout-out to Conquest Racing driver, Bertrand Baguette, as he represents the IZOD IndyCar Series on the world stage in this weekend's Race of Champions in Dusseldorf, Germany. Baguette makes his debut in the race, having been voted in via a public poll. BB will attempt to put the IndyCar beat-down on such notable international drivers as Michael “Schumi” Schumacher, Sebastian “Wonder Boy” Vettel, and Alain “Crooked Nose” Prost. Get all the details on the RoC here, and send the love to Bertrand via his twitter account here. Tear it up, Mr. B. Good stuff! Can't wait to see Baggy/The Bagman/Triple B/Breadman/Baguette back in IndyCar in 2011! I seriously believe he's got the talent and will get the following to be something special in our series.